Welcome to the website of the Cheadle and Gatley U3A. The group was formed in the summer of 2011 and we now have about 250 members with 32 Interest Groups operating. By clicking on the buttons at the top of this page you can find the following information. GROUPS Details of all our current Interest Groups and Open Groups within the NE Cheshire Network. EVENTS Details of our regular Monthly Open Meetings. CONTACT A contact form by which you can send an email message to Cheadle and Gatley U3A. GALLERY A collection of all the images which can be found elsewhere on the website. U3A Information about the National Organisation and National Events. • A New Members' Leaflet which gives outline details of Cheadle and Gatley U3A. These give comprehensive details about the activities of our Interest Groups over the last year, with contact and meeting details. • Information about the North-West Regional U3A. • The Archive section which contains earlier editions of the Newsletters and other archive material. 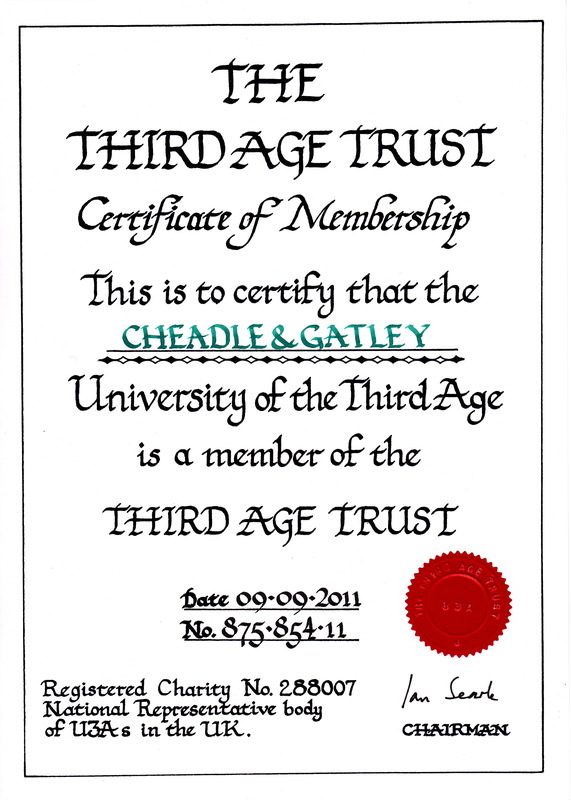 Information about the cost of joining Cheadle and Gatley U3A is in the Membership link opposite. • Please read the New Members' Leaflet in the link opposite to give an overview. • Please read the latest Newsletter in the link opposite to see details of our Groups. • EITHER download, print and complete an application form from the link opposite and send it with a cheque to the address on the form. • OR come along to our next meeting on the 2nd Wednesday of the month at 1.15 at the URC Elm Road Gatley. Your first meeting is free, and there you can fill in an application form and join. Please note that you cannot enter your details onto either the Membership Application or Renewal Forms online. Please print the form and enter the details by hand. You can then apply for/renew your membership by post or at the monthly meeting. If you would like us to be able to reclaim the tax on your annual subscription (known as a 'donation' for tax purposes), please download and fill in the Gift Aid Declaration Form in the links opposite. Thank you. Some Interest Groups within our local network (North East Cheshire) have been designated as ‘Open Groups’, and can be attended by members of other U3As in the Network. More details can be found on the Groups Page by clicking the Groups button above, and there is a list of Network Open Groups in the link opposite. As part of our COMMUNITY INVOLVEMENT this year 2018-2019, we invite you to purchase books at our monthly meetings, the proceeds from which, along with the money raised by the Christmas raffle, will be passed on to the URC to go towards the purchase of a defibrillator. This website is comprehensively updated twice a year, in January and July on the publication of our Newsletters. If any user finds any error, typographical or factual, or omission, then please advise us using the Contact button above. Also, if any Group Coordinator wishes to add details about their group e.g. their forthcoming programme, advise us in the same way.